Pure Ice releases another pop-culture inpsired polish collection: 5 Shades of Grey. I just had to post about these polishes as I am literally in the midst of reading the 50 Shades series (blushing! I know what ya'll are thinking.). I had to give into the hype and give the series a try. Mr. Grey certainly is no Edward. But, I must admit, the series is "interesting". While the character development is a bit lacking and not often believable, you have to give this series some credit for inserting such a taboo subject into the consciousness of the masses. But, does anyone else find Ana's "Inner Goddess" cringeworthy? lol! All Mr. Grey references aside, I am a fan of silver and grey polishes. So, this set is totally up my alley! Here are the polishes. Some of these seem to be pulled into this assortment from their permanent line. I love being able to "mix up" my "shades of grey" into one polish look. Like doing a subtle accent nail on the ring finger with a different grey. The assortment I got was somewhat different from the swatches above. I did not get "Risk Taker" but "Eyes of Steel instead" and "Electric!" instead of "Kiss Me Here". Here is my look that I created with some polishes from this collection. I used "Eyes of Steel" on most of my nails with "Electric!" on my ring fingers as an accent. I topped off this whole look with "Lightening Strikes" Crackle. "Elecrtic!" is destined to be one of my favorite polishes when Fall and Winter arrive. 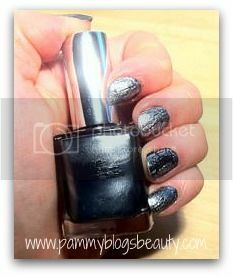 It is the perfect black with subtle sliver shimmer. Beautiful! Love the book series, or leave it. But, don't pass up this nice assortment of Greys! I love being able to mix up my nail looks while giving a nod to mister "50 Shades of..."